With images from the collections of the Lubec Memorial Library and Edith Comstock. Prior to construction of an appropriate landing in Lubec passengers and freight were ferried across the bay to Eastport to board steamships bound for New Brunswick or Portland and Boston. Photo donated by Edith Comstock. In the 1890s, as the era of sail was waning, steamships regularly carried passengers and freight from Boston and Portland to St. John, New Brunswick, stopping in Eastport. Service to Lubec was not possible due to the lack of suitable docking space. All Lubec freight and passengers had to be transported across the bay to Eastport to gain passage to Boston and other points. Due to Eastport’s connection to Boston the town had the best stocked stores in the county. It was said that the lines of clothing, hardware, shoes, and ship chandlery were the best east of Bangor. Lubec stores seemed primitive by comparison. This dependence on Eastport for goods and transportation did not sit well with Lubec’s merchants and a committee, including C.J. Staples, B.M. Pike and C.H. Clark, was formed to secure steamship service for the town. They presented their case to International Steamship Company officials, including records of goods shipped to and from Lubec in sailing vessels and estimates of passenger traffic. Although they made a good case their request was denied due to the lack of a wharf that could accommodate such large vessels. However, the steamship company did agree to serve Lubec if adequate docking space was guaranteed. Bolstered by this agreement and their own determination the committee returned to Lubec and formed a company to construct such a wharf. Shares in the new venture sold quickly. Onlookers await the S.S. Cumberland arriving from Boston for the first time. This is the original freight list for the S.S. Cumberland's first voyage from Boston to Lubec. It reflects the extent to which Lubec businesses benefitted from the new service. Item donated by Edith Comstock. Those receiving freight were C.L. Adams, who owned a store at the head of the ferry wharf; R.H. Bangs, a North Lubec merchant; W.B. Cottle, the proprietor of Merchants Hotel; M.M. Foster, postmaster and storekeeper; Chas. Gove, North Lubec sardine packer; A.W. Kelley, druggist; Pike’s Market; A. Rowell; A.B. Sumner and Co.; Staples & Son, general merchant; F.Y. Trefry, postmaster and merchant in South Lubec; F.M. Tucker & Co.; Trecartin Brothers, operating Lubec’s first hardware store; J.W. Allen and Lorenzo Allen, South Lubec; E.U. Brown, sardine packer; N.W. Marston and Willie Marston, South Lubec; W.B. Mowry; T.G. Mitchell’s grocery store; E.L. Ring; and Wilbur A. Shea, who received 25 barrels of cottonseed oil which he sold to local sardine packers. Freight haulers also benefited greatly from the new steamer service with horse drawn single and double hitches a common sight along the wharf. Lubec proved to be a good source of revenue for the steamship line which ran three round trips a week. A ticket for the trip from Portland, approximately 187 miles, cost $4, with an additional charge for meals and staterooms. The steamers also brought an increase in summer tourism. "The first landing of a passenger and freight steamer from the outside world..." This announcement, made by the ship's purser, heralded the Cumberland's arrival and initiated the festive ceremony marking the occasion. The wharf was later taken over by the Eastern Steamship Company and rebuilt. The landing, built with funds raised by local businessmen, brought steamships and increased prosperity to Lubec. “After her passengers had been landed the Cumberland staggered across the channel to the Atlantic Works, where she will be repaired. Abandoned following the collision, the Cumberland was eventually purchased by the Joy Steamship Line, refitted and re-named Larchmont. The Larchmont The Larchmont, formerly the S.S. Cumberland, collided with the Harry Knowlton in Long Island Sound on February 11, 1907, a disaster resulting in the deaths of nearly 200 passengers. Photo Courtesy of the Larchmont (NY) Historical Society. The Rhode Island Century described the Larchmont “as one of the finest side-wheel steamers of her day, well over 250 feet long with 37 feet of beam. A white oak hulled ship; it displaced more than 1,600 tons, boasting three deck levels and two masts. The 1,000-horsepower engine was capable of a speed of up to 12 knots. Its regular route was the Providence – to – New York run. On February 11, 1907, in the middle of the night, in what would be Rhode Island’s worst maritime disaster of the 20th century, the Larchmont was hit by a coal-hauling schooner, the Harry Knowlton. The Knowlton tore into the Larchmont during a blizzard, causing it to keel over and fill with water. The boilers exploded, filling the ship with steam. 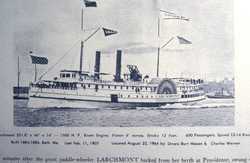 Within 15 minutes the Larchmont sank taking most of her passengers to their deaths. News reports put the death toll between 183 and 200; the only copy of the passenger list went down with the ship. There were only 17 survivors. The Larchmont, which as the Cumberland brought passengers and prosperity to Lubec, now lies beneath 135 feet of water in Long Island Sound. “Lubec … 1800: A Century of Progress”, The Herald Magazine, December 1899. The New York Times, July 8, 1902. The Rhode Island Century, The Providence Journal Company, 1999. S.S. Cumberland Freight List (original), August 31, 1893.